Wegmeyer Farms is off the beaten path, you might say. The last bit of road that goes out to the farm is definitely country with gravel, dirt, an old single lane bridge, and a number of deep ruts. But it’s a beautiful ride and well worth the trip to see their gorgeous hillside pumpkin field and 30+ varieties of pumpkins, including many heirlooms with a broad spectrum of colors and shapes. 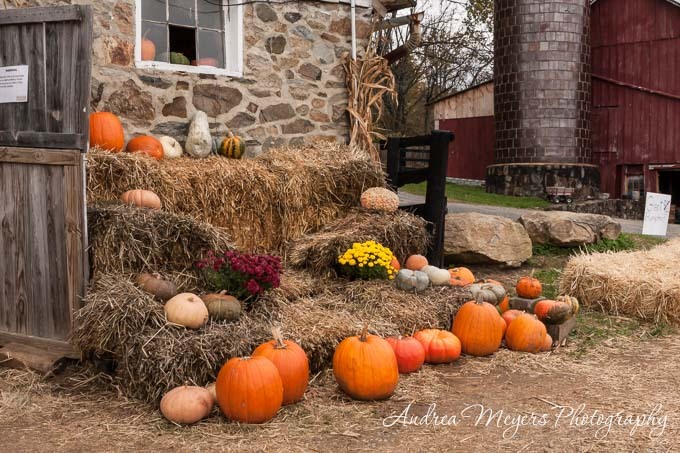 I visited their old stone barn and pumpkin field about a week before Halloween and enjoyed the crisp autumn air and scenery. As I wandered through the field studying all the different pumpkins, I found myself drawn to the bronze Fairytale pumpkins and the dark green round pumpkins, though I couldn’t remember the name from the cheat sheet in the barn. I selected one of each and carried them back to the barn. The pumpkin field isn’t too steep, but steep enough that lugging my pumpkins up the hill left me a little winded as I neared the top. They have wagons you can use to bring pumpkins back up to the barn, which I recommend for the larger pumpkins. The farm is now closed to visitors for the season, but you can still find Wegmeyer Farms pumpkins at several DC area Whole Foods Markets. They will reopen in the spring for strawberry season, and when autumn comes back around next year, Wegmeyer Farms should be on your list for a visit to the pumpkin field. 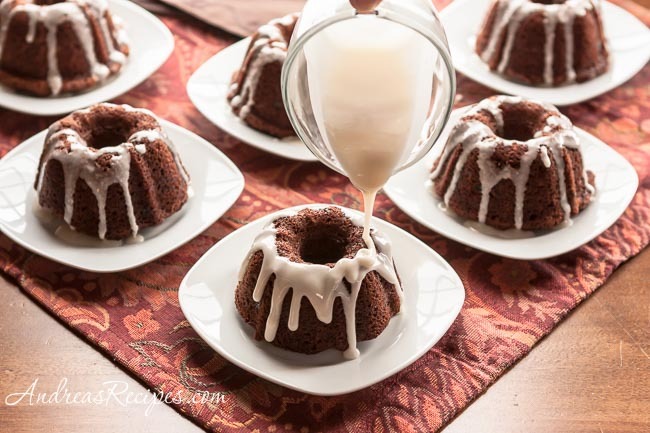 Roasted fresh pumpkin puree adds plenty of pumpkin flavor to these simple mini Bundt cakes, which are shaped a bit like pumpkins themselves and make a pretty presentation with the ivory colored maple glaze. 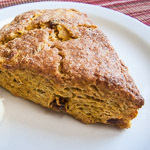 The cakes are spiced with molasses and pumpkin pie spice, or you can use a mix of cinnamon, ginger, nutmeg, and allspice. I tried Trader Joe’s pumpkin pie spice for the first time, which has a little lemon peel and cardamom in addition to the traditional pumpkin pie spices, and we really liked the flavor in the cakes. Each cake can serve two, though hearty appetites may want more. Warm the apple brandy in a microwave safe bowl or on the stove in a small saucepan. Remove from heat and stir in the currants. Allow to soak about 10 minutes, then strain. Beat the softened butter at medium speed with an electric mixer until creamy, then gradually add the brown sugar and mix on medium speed until the sugar and butter are completely combined and a little fluffy. Add the egg and mix until blended. 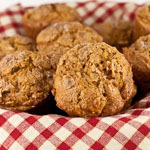 Add the pumpkin puree and molasses and mix well. Stir in the soaked currants. In the medium bowl whisk together the flour, baking soda, spice, and salt. Gradually add to the pumpkin mixture, beating at low speed just until blended. Distribute the batter evenly among the 6 mini Bundts, which should fill each about 3/4 full. Bake in the preheated oven until an inserted toothpick comes out clean, about 22 to 26 minutes. Allow cakes to cool in the pan about 10 minutes, then remove from the pan and finish cooling on a wire rack. Top with the glaze, or if you need to store the cakes, wrap each tightly in plastic wrap. Will keep for up to 3 days. 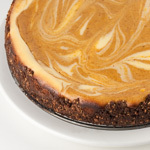 GLAZE: In a small bowl, stir the confectioners sugar, maple syrup, and milk together with a fork. Drizzle over the cakes just before serving. I’m a little bit infatuated with bundt cake – love this recipe! Thanks Kristen! I adore Bundt cakes, always have.